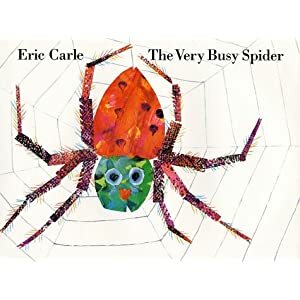 The book I chose for today is The Very Busy Spider by Eric Carle. After we read the book, we made a spider web. After we found some leaves, I had Aubrey peel a black crayon. Once the crayon was peeled, I showed her how to do a leaf rubbing. I helped her by holding the paper and by making sure she moved the leaf around to all the white areas. Aubrey chose where she wanted her spider to sit and then she glued him on. Time to give the spider legs! I was going to use this time to talk about how many legs a spider has but she already knew. I love when that happens! I had her draw eight legs on her spider's body. Here is her finished web. My girls and I so enjoy making connections with what we are reading so I was excited to find your 31 days. I'm looking forward to following for the rest of the month! Found you through the Nester... so glad to stumble upon this... I have 2 yr old and a 3 yr old and we LOVE to read, my 2 yr old especially loves this book :o) We will definitely be trying this out, thank you for sharing. I love how you presented the project... may I make one suggestion in that it would super helpful if you shared what ages it would be good for? I hope that doesn't come across negative... it was just something I was wondering. Thank you for your hard work!